This has been another filled week in the SWTOR community. The San Diego Comic Con finished up Sunday and SWTOR had its panel for “Meet the Companions.” Fans at the event were able to meet the actors behind the voices of the companions that accompany our characters. There was also another treat for the folks at San Diego Comic Con and now the rest of us…a short very well rendered trailer, finally confirming that there would be a certain new companion for us, “meatbags” to attempt to acquire. 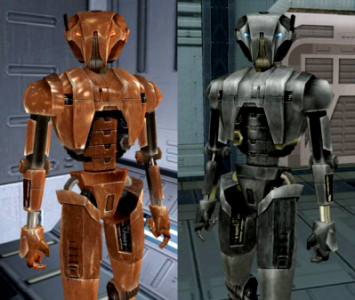 If any of you played the two predecessors, KOTOR I & KOTOR II, you know about the assassin droid HK-47 and the newer model HK-51 model. It has been confirmed that the latter, HK-51, will be able for players to get through a series of steps. This process is not exactly known, but it has been reported that it will require a level 50 in one faction and a mid-level character on the opposing faction. The rest of the steps or quest to obtain the new companion has been kept secret. Personally, I am hoping that it has something to do with learning more about the droid factory where they were made. This factory was suppose to be in KOTOR II, but was in the finished game. All we know is from the following blog update and inserted video clip below. Do you hope there are ties to the past KOTOR games and the previous model HK-47 in the quest to obtain the companion? Let us know if this is the droid you are looking for in the comment section below. Allison Berryman made a relative small forum post. In my opinion it is a huge deal, because there will be individual server forums! This is great news. This helps a server develop an identity. It also helps members of the server be able to coordinate events, build strong alliances and even develop those rivalries with the opposing faction or even other guilds as far as boss kills etc. This is one area I am glad BioWare finally realized the community has wanted a forum for each server. This is a good thing in my opinion, but what do you think. Let us know in the comment section below. In his post he states that they will be moved, but your character or characters will not be deleted. The next topic has been an ongoing request with the community and that has to do with Third Party add-ons. Allison Berryman addresses this and also asks for suggestions from the community to help make improvements on the UI. As you can read in her forum post there is not any news about whether or not they will be allowing Third Party add-ons for the interface. Now that being said she stated they want your input on how the UI can be improved. So after reading her post, think about what you would like to see improved with the UI and reply with your constructive ideas. There are more topics, so make sure you check out the full set of links and summary of all the dev tracker notes from July 10th through the 16th in this week’s Dev Tracker Blog. It has been a bit more of a challenge getting online and into the game for me this week. We have finally gotten some rain, which has been very welcomed, but the lighting storms have made it a bit tricky being online. Although my time in-game has been great and very enjoyable as I keep leveling higher. The best part has been seeing more people, not just on fleet, but on the planets. This has made questing fun, even if I happen to see someone in the same area it has been better grouping just to help someone out. How has the game experience been for you lately? While you are here I hope you take a moment to check out our articles from the past week. Be sure to also comment on the rest of our staff’s articles. We really love your feedback and discussions. Do you find yourself wondering what to do in the game at times? Well one guild and members of the Ebon Hawk server have decided to take matters into their own hands. The guild, Kal’Vyshde has helped sponsor and promote events on their server. These events have been from their Fight Night. Check out the video. From the video you can see it is almost like “Fight Club,” but that can’t be because the first rule about “Fight Club” is don’t talk about “Fight Club”…however if such an event did exist here is some information from Tziena from the Kal’vyshde guild. “The Kal’Vyshde are a series of events that feature the underground of Star Wars: The Old Republic. It’s a place where Imperial, Republic, Hutt, and everyone else can rub shoulders with each other — no questions asked. I also asked the guild a few other questions and they were gracious with their time to answer. The following responses were from Niatara another member of the guild Kal’Vyshde. 1) How did this event get started? The Kal’Vyshde was something Vaanthe and I decided to go into together after the success of fight nights, our first venture into a rave, and some personal changes between us and how we wanted to see things done. Niatara approached Vaanthe with her idea to take their venture into a different direction, the two of them sat down ICly and hashed some ideas out, and that’s where we came up with the Kal’vyshde. The word Kal’Vyshde is an Iridonian Ul’zabrak fanon word for “war dance”, it seemed fairly appropriate considering both characters are Iridonian, and the events center primarily around fight nights and raves. 2) How often does it happen? We have an event every few weeks in alternating pattern, at least once a month there is something (our two weeks aren’t exactly the same time EVERY month), but roughly about every three weeks we’re doing something. We alternate between PVP style fight night, Rave, and MMA style rp fight night. 3) Are the fights for prizes or more like server bragging rights? There are actual prizes offered, financially IC and OOC for the winners of fight nights, along with the bragging rights of being the Kal’vyshde champion. However, oddly enough majority of our winners have almost always turned down the prize money. 4) If players on the Ebon Hawk server want to participate who do they did to contact and is there an entry fee etc.? One thing I don’t think people realize behind the scenes of the Kal’Vyshde is the fact that it’s an RP Business. We actually have partnerships, Vaanthe and Niatara are the primary share holders and CEO for lack of a better term, they come together to make the CEO board of the Kal’Vyshde. We also have share holders, which is exactly what it sounds like, sort of a board of trustees really. Each share holder holds a certain percentage of the proceeds in exchange for money they put in, they receive a monetary figure back, along with the abilities to ICly and OOCly make suggestions, help set up events, etc. It really gives a certain dynamic appeal to the Kal’vyshde for us, and offers some real business world rp to things, which for my character and Vaanthe’s is something that works very well for them. Niatara’s no longer broke. It’s BECAUSE of these events and the subsequent roleplay that she’s managed to amass a hefty profit return, and it was all started with an idea that lead to roleplay that put things in motion. A sort of rags to riches if you will. As far as contacts go, Niatara and Vaanthe are the ones to really get in touch with for involvement. Niatara Republic side and Vaanthe Imperial side. Two partners, from two separate organizations, that came together to make an actually profitable business. Now don’t think that one-on-one combat events are the only thing this guild and members of the Ebon Hawk server have planned. In fact, just last night and into the early morning hours they had a server Rave. Unfortunately, I did not have a character on the server to get more details or be able to attend the actual event, but if the Rave last night was anything like the below promotional video it was a wild time to be sure. 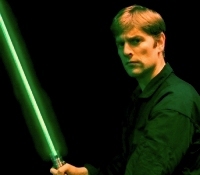 This weekend in Duluth Minnesota at the Zeitgeist Arts Theater you can go see, if it is not sold-out, Charles Ross’ The One Man Star Wars Trilogy. This Canadian born comic condenses the original trilogy into 90 minutes of pure comedic and geek “awesome-sauce.” In the clip below you will hear how he got the nerve to ask George Lucas for permission to make the movies into a one man stage performance…no props or costumes. You also will see what Lucas asked him to do before he agreed to let Charles do the show. Check out the clip and let us know what you think and if you are in the Duluth, Minnesota area, be sure to contact the Zeitgeist Arts Theater to see if any tickets remain. @Onath Thanks for the comment and compliment. Yes, he is hilarious. You should check out some of his other video clips on Youtube!